This illustrates the datasets.make_multilabel_classification dataset generator. Each sample consists of counts of two features (up to 50 in total), which are differently distributed in each of two classes. A star marks the expected sample for each class; its size reflects the probability of selecting that class label. 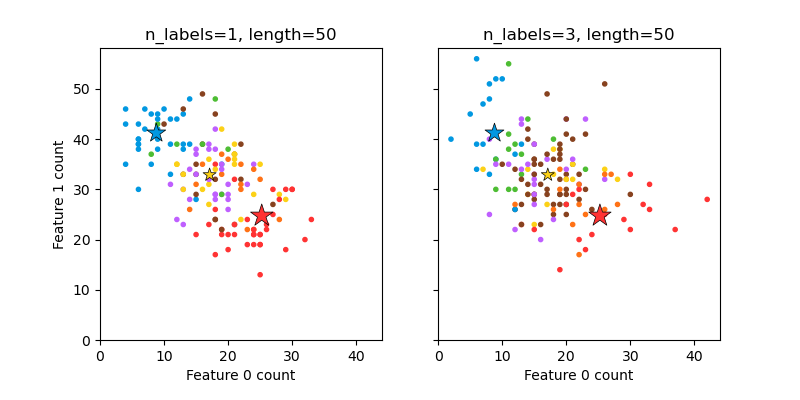 The left and right examples highlight the n_labels parameter: more of the samples in the right plot have 2 or 3 labels. Note that this two-dimensional example is very degenerate: generally the number of features would be much greater than the “document length”, while here we have much larger documents than vocabulary. Similarly, with n_classes > n_features, it is much less likely that a feature distinguishes a particular class.